The Vodacom Bulls scored five tries to register a convincing 32-17 bonus-point victory against the Reds at Loftus on Saturday. MARIETTE ADAMS reports. 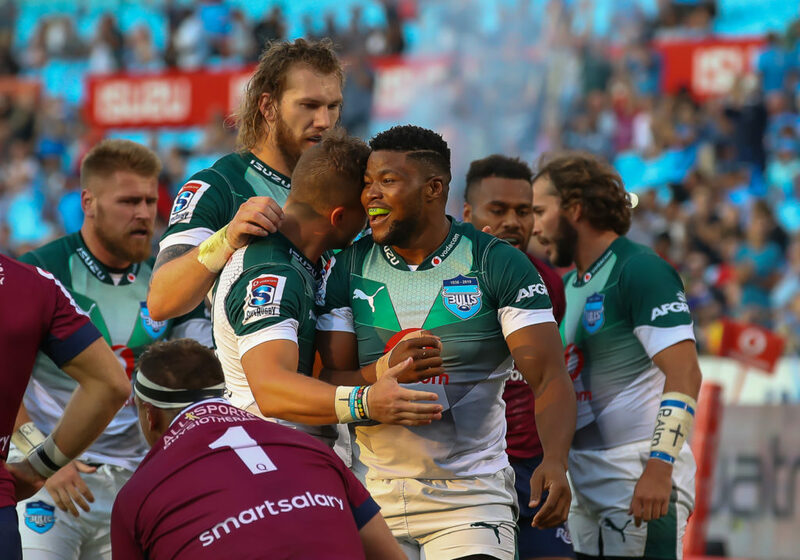 The Bulls welcomed back a host of Springboks and this was reflective in their dominant performance, which will no doubt please coach Pote Human after their implosion against the Jaguares last week. Notwithstanding their upset win against the Stormers in Brisbane last week, the Reds remain the worst-performing Australian side and were thus inserted here as overwhelming underdogs. And true to form, they put together a messy performance that saw them fail to live with the Bulls’ pace, power and precision. The Bulls won the battle up front, with the likes of Marco van Staden, RG Snyman and Lizo Gqoboka causing the Reds all sorts of problems. The hosts’ strong scrummaging and accurate lineout receipt put the Reds at a disadvantage, while the return of Warrick Gelant also made a world of difference to how the backline shaped up in attack and defence. Simply put, the Bulls ticked all the boxes that enable complete dominance. It took the Reds just a couple of seconds to open the scoring when an untidy and ill-disciplined passage of play resulted in a penalty against the Bulls, which Bryce Hegarty converted into points. The Bulls would have been disappointed with that start, but they immediately began to assert some pressure to gain a measure of control of the game. An explosive burst by Johnny Kotze gave the home side all the momentum and when the wing was hauled in just short of the Reds’ line, prop Lizo Gqoboka followed up with the pick and drive to crash over from close range. Handré Pollard skewed the conversion but when the Reds were penalised for streaking offside, he made no mistake from the tee as the Bulls went 8-3 up. This came as due reward for the Bulls, who enjoyed 78% possession and 79% territory in the opening 15 minutes. The next sequence of play was end to end. The Reds’ Tate McDermott intercepted a loose pass and carried it well into the 22. But the Bulls retained possession and launched a counter-attack. Gelant accelerated into space and freed up Jade Stighling for what should have been an easy try. But the wing fluffed it when he lost control of the ball just as he was about to dot down. The last thing the Reds needed was to lose their discipline in the danger zone, yet that is precisely what happened. Gelant hacked the ball into space and Stighling put in a decent chase, but he was beaten to the ball by fullback Hamish Stewart, who slid into touch. Stewart then cynically grabbed the ball and threw it away to deny Stighling the chance to execute a quick throw-in and was duly punished. The Bulls set a 5m lineout, but with the Reds expecting a maul, Van Staden broke away to score in his first appearance of the season. Stewart was up to no good again in first-half stoppage time. With his side on the attack, he was penalised for a dangerous cleanout at the breakdown. And while the Bulls did have an opportunity to set a lineout to launch an attack, Stewart was lucky to escape any further sanction. The Reds were much-improved in the second half, somewhat balancing the territorial and possession stakes, but they were still not on par with the rampant Bulls. No sooner had the second half begun, and Pollard landed another telling blow, when he scored a self-converted try under the posts. And the Reds could just not stop the rot. Two strong runs by Jesse Kriel and Snyman resulted in a try for Hanro Liebenberg, before Stighling finally got his try when he ran on to a pin-point kick-pass from Pollard. Reds captain Samu Kerevi bagged a second-half brace to put some respectability on the scoreboard, but they were unable to deny the Bulls a deserved bonus-point victory that sees them leapfrog the Sharks into pole position in the South African conference. Bulls – Tries: Lizo Gqoboka, Marco van Staden, Handré Pollard, Hanro Liebenberg, Jade Stighling. Conversions: Pollard (2). Penalty: Pollard. Reds – Tries: Samu Kerevi (2). Conversions: Bryce Hegarty (2). Penalty: Hegarty. Bulls – 15 Warrick Gelant, 14 Johnny Kotze, 13 Jesse Kriel, 12 Burger Odendaal, 11 Jade Stighling, 10 Handré Pollard (c), 9 Ivan van Zyl, 8 Paul Schoeman, 7 Hanro Liebenberg, 6 Marco van Staden, 5 RG Snyman, 4 Jannes Kirsten, 3 Trevor Nyakane, 2 Jaco Visagie, 1 Lizo Gqoboka. Subs: 16 Corniel Els, 17 Simphiwe Matanzima, 18 Wiehan Herbst, 19 Thembelani Bholi, 20 Roelof Smit, 21 Embrose Papier, 22 Manie Libbok, 23 Divan Rossouw. Reds – 15 Hamish Stewart, 14 Jack Hardy, 13 Chris Feauai-Sautia, 12 Samu Kerevi (c), 11 Aidan Toua, 10 Bryce Hegarty, 9 Tate McDermott, 8 Scott Higginbotham, 7 Liam Wright, 6 Lukhan Salakaia-Loto, 5 Harry Hockings, 4 Izack Rodda, 3 Taniela Tupou, 2 Alex Mafi, 1 JP Smith. Subs: 16 Brandon Paenga-Amosa, 17 Harry Hoopert, 18 Ruan Smith, 19 Angus Blyth, 20 Angus Scott-Young, 21 Moses Sorovi, 22 Duncan Paia’aua, 23 Jock Campbell.